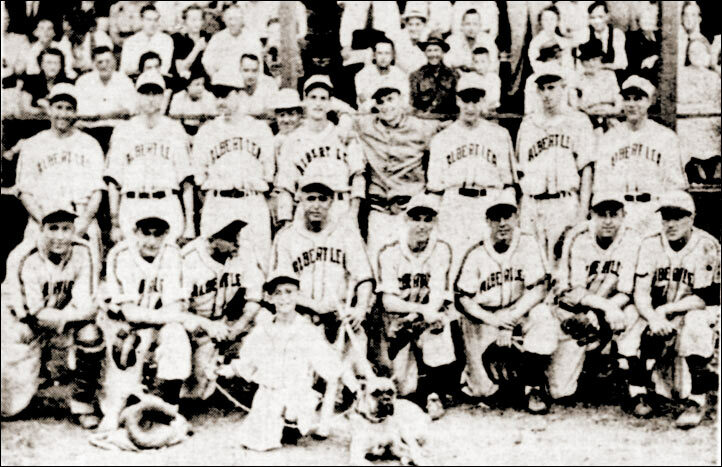 The 1948 Minnesota champion, Albert Lea Packers. Packers won the AA division title for the fifth stragiht season. Back row (left to right) – Mel Harpuder, Bob McCabe, Stan Sevaldson, Wanous Mossor, Earl Mossor, Herb Terhaar, Lester Swenson, Russ Schmidthuber. Bottom row – Maurice Gorham, Bob Dolan, Shanty Dolan MGR, Gordy West, Don Blanchard, Clayt Hougard, Don Opperman, Jack LaVelle. In front, batboy, Neal Dolan (and friend).